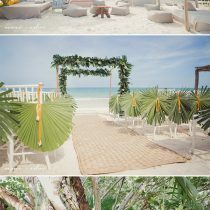 Having a beach wedding a little later in the evening works great for photos! As the sun starts to go down, the light hits at just the right spots. This lovely San Diego destination wedding, shot by the famous Archetype Studio, is held at a local venue right on the water. With chiffon themes and ivory as the main color of choice, this San Diego destination wedding keeps it simple and elegant with the naturally accenting colors of roses and orchids. 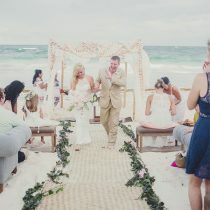 At the wedding arch, instead of the traditional union candle lighting, the bride and groom are encouraged to pour their respective cups of sand into a vase that represents their love standing the sands of time. Under a star-like string of lights, the reception continues the celebration with an immaculately floral-designed table that includes everyone. Stunning! The floral details on the backs of the reception chairs are quite breath-taking as well!